Have you failed in the 10th Board Exam? If yes then don’t worry dear students because Board of Secondary Education, Rajasthan has all set to conduct Supplementary Sec Exams from 10th August 2017 to 12th August 2017. To save their one year of education life then you must appear in it. 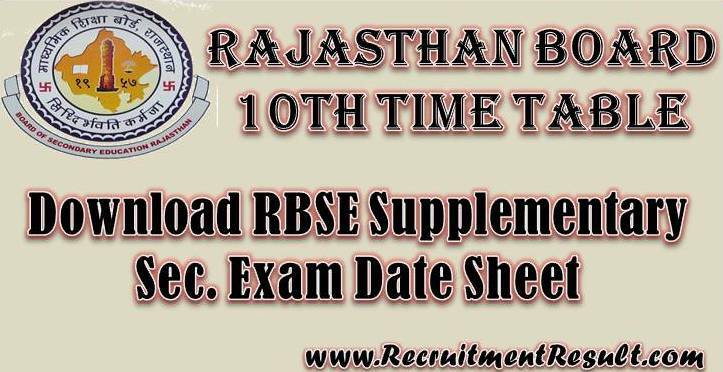 Participated contenders in Supplementary Exam may download the Latest Rajasthan Board 10th Time Table 2017 and start preparation according to it. You can also get examination schedule in pdf format from below provided direct link. Must go through this article and get complete details about the same. Board of Secondary Education, Rajasthan is also recognized as BSER and it was founded in 4th December 1957. It is government board of school education and the board’s head office is located in Ajmer, Rajasthan. Yearly it organizes the two main exams namely 10th class exam and 12th exam and both exams (10th and 12th class) are very important for all candidates. Keep in mind that these classes’ marks are required on government department for the job, college admission and different reputed private companies are provided jobs. Now as per recent analysis, Board of Secondary Education, Rajasthan took speedy strides for approval and development of Secondary Education in Rajasthan. Board’s motive of organizing examination is to check knowledge of students and promotes them to next level of education and yearly association conducts annual exams for 12th / 10th class of Science, commerce, Arts streams in the month of March/April. Now they’re going to organize supply exam to provide scorecard for students to go to next level of education. How To Download Supply Exam Schedule? Students will have to open official website of Board of Secondary Education, Rajasthan or visit above provided link. After opening the official web portal, you may select “Suppl.2017 Time-Table” link from ‘News Update’ section. After hitting on said link, your Rajasthan Board 10th Time Table will appear in front of you. Now, download it, save it on your desktop and take printout of it for examination purpose.